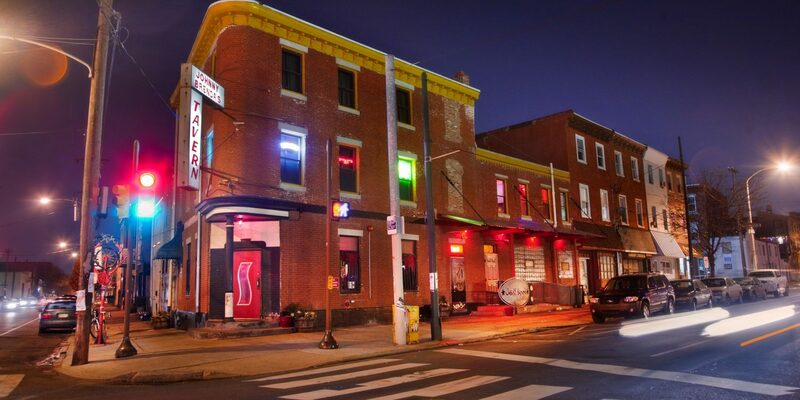 In 2006, before Fishtown was the epicenter of hipness and the latest hotspot for suburbanites to explore on weekends, Johnny Brenda’s was a former boxer’s bar in a gritty neighborhood. At the intersection of Frankford and Girard Avenues in Fishtown –– arguably one of the most active spots in the city –– every Philadelphian at one point or another will touch down at JB’s. And the possible combinations for libations and sustenance before and after any performance are practically endless. Make it a date night and fill out your itinerary for the entire evening with nearby food and drink. Mere feet from Johnny Brenda’s is the Philly outpost of Stephen Starr’s Brooklyn BBQ joint. With a vibe that leans more Bayou than Brooklyn, the communal tables and porch seating make it a friendly spot to grab a whiskey and scarf down cheap, yet tender, meats. Head up to the counter; make your choice of pork, brisket, chicken, or sausage (and, of course, sides) by the pound; and find an empty seat. Monday through Friday from 5pm to 7pm, scope out Fette Sau’s happy hour for half-off drafts, $5 Manhattans and Old Fashioneds, and a number of cheap bites like $3 smoked deviled eggs, $4 smoked chicken legs, and $5 burnt end “sandwiches.” Get there early-ish or be prepared to brave the long lines. If you’re short on time and have a sweet tooth, sneak into this cozy and cutesy ice cream shop. Founded in 2012, this small-batch ice creamery opened a brick-and-mortar store in Fishtown at the end of 2016. Their flavors lean light and fresh, like black raspberry, mulberry, cinnamon-toasted oat, and strawberry rhubarb, and are constantly rotating (so you never quite know what you’re going to get). For the non-dairy crowd, their chocolate sorbet is killer. Go hard and pick out one of their artisanal ice cream sandwiches, which are way better than the ones you find in your grocer’s freezer case: Everything from pralines, pound cake, or shortbread cookie surround Weckerly’s always-changing seasonal flavors. While it sounds like a hearty snack, you’ll never leave feeling grossly full or sugared up. A quick walk down Frankford toward Delaware Avenue is the only Barcade location south of Newark, and it’s one of many Fishtown locales where it feels like nighttime no matter what time of day it is, given the dark wood floors and exposed brick. Craft beers are always on tap, including brews from the nearby Dogfish Head and Victory Brewing Company, and vintage arcade games line the bar, including classics like Mortal Kombat II and Ms. Pac-Man. Trade your cash for tokens at the respective machines — 25 cents gets you one token, which will get you one round of play on most games — and bask in the din of competition over a loaded plate of $7 nachos and an $8 Jim Beam shot and a beer. Their happy hour runs from 5pm to 7pm Monday through Friday and features $1 off wine, beer, and well drinks, and half-off select menu items. One of Fishtown’s newest additions just landed on Bon Appetit’s list of top 50 nominees for Best New Restaurant, and the accolade is much deserved. The all-day Lebanese cafe is now open for dinner with a picturesque menu of Middle Eastern small plates — like labne (strained yogurt) and batata harra (crispy potatoes) — and larger dishes including dry-aged ribeye for two and grilled halibut kabab. The vibe is a little more upscale and you’ll need a reservation to sink your teeth into that heavenly pita, so plan accordingly. Take advantage of the romantic lighting in the bathroom and snap the best mirror selfie of your life. Another eatery to gain recognition from Bon Appetit, this upscale pizza and pasta joint housed in a former whiskey bottling facility also whips up a mean cocktail — creative, but not too out-there. A drink will run you anywhere between $10 and $15, though it’s totally possible to get a full meal here — pizza, pasta, and drinks — without spending a pretty penny. The menu does rotate seasonally, so take advantage of the latest and greatest. And try to get a seat by the fireplace if you can. You don’t have to go far after your show for a late night drink. Either hang at the upstairs bar (though last call is shortly after the show ends) or head downstairs and see who’s spinning records. Grab a seat at the bar and a $3 Kenzinger for a night of easy hangs or take over a table in the back for a more intimate affair. With a revamped menu, and a kitchen that’s open until 1am, it’s not a bad place to grab a snack, either. Check out the new raw bar offerings like shrimp cocktail and tuna tartare. Curb your post-show munchies without walking more than a few feet. Open until 10pm Sunday through Wednesday, midnight on Thursday, and 3am on Friday and Saturday, a late-night steak is no longer just a fantasy. (It’s on the other side of the street from JB’s and you can’t miss their neon signage.) With an old-school diner feel, complete with counter service and booths, get your steaks made fresh and however you like them — topped with American, provolone, or Cheez Whiz, and the usual toppings like onions, peppers, and mushrooms. They also have vegan options, sausages, burgers, and a chicken sandwich. Just a short walk up Girard is Lloyd, an unfussy bar that offers a whiskey list with over 100 possibilities. This is your spot for bourbon, scotch, beer, and other spirits in comfortable digs. Decor-wise, think wooden tables, ample lighting, and Victorian wallpaper. Lloyd offers a variety of boilermakers — if you’re looking for that kind of night — with combinations like Pabst Blue Ribbon and Buffalo Trace Bourbon and Murphy’s Irish Stout and Bushmills Red Bush that won’t run you any more than $10 each. Cheap beer and fun company are par for the course at this neighborhood dive, located under the El (hence the name). Make the short walk over for cash-only beverages, dark and dingy aesthetics, outdoor seating, and all the Citywides you could ever want to fuel the best or worst decisions. Whether it’s a PBR pounder or a well drink, you won’t spend any more than $5 and there’s usually free pizza later in the night, too. If it’s a Monday, expect the karaoke crowd. If it’s a weekend, expect just a regular old crowd. For something a bit more refined, wander a little farther down Frankford until you get to Martha. Complete with kitschy decor, a fireplace, and a record player, but with industrial touches like high ceilings and concrete tables, Martha serves local everything, from the beer and wine to the eats. In the summer, the outdoor patio is ideal for quiet nights playing bocce ball. The kitchen is open until 1am, so you can grab a post-show hoagie. Choose from one of four, including the Vegan Jawn (carrot terrine, fermented radish, dried eggplant, tofu mayo) and an Italian hoagie (fennel and Calabrese salami, mortadella, Caputo provolone, long hot spread), all served on Philly Bread Company rolls. Want more? Follow us on Instagram and Facebook for ticket giveaways and more of the best happenings across the country. Allie Volpe is a culture, entertainment, and lifestyle reporter based in Philadelphia. She is a distance runner, loves dessert, and has the same birthday as Beyonce.